you and guide you to change your profile display name with ease! If you’ve recently changed your name or likely want to change your name on Facebook. Facebook frowns upon using fake names, but allows you to change your name up to four times. Follow this guide to learn how. Step 1:Log in to Facebook and click the Gear icon in the top-right corner of the page. Select “Account Settings”. Step 2: Click on your name to open the name editor. You can enter a First, Middle, and Last name, as well as an Alternate name (such as a nickname or maiden name). Some PTR:*Your name can only be changed four times. *Facebook wants you to list your name as it appears on your credit card or ID. **You cannot use symbols, numbers, random capitalization, or punctuation. ***Your middle name cannot be words or phrases. Step 3: Enter your real name. Facebook does not allow you to impersonate someone else, or create a page for a fictional character/Business Promotion/Marketing purpose. Accounts found in violation of this will be forced to change the name or your account get suspended. Step 4: After Changing your Name , FB forced you to enter your password for security purpose....So Enter your password. To change your name, you will need to enter your password into the box before you are allowed to save your changes. Step 5: You have to click "Save Changes" tab for final execution of name changing process on FB! you have to wait for 24 to 48 hour's till the final change appears on your FB profile! Step 1:To access this on the mobile app, Login to your FB app on your mobile, then click on "NEWS Feeds" Section! Step 3:From the opened "More" interface, scroll down and tap/Click on the "Account Settings" option available under the "HELP & SETTINGS" section. Step 4: Now from "Setting" drop down menu select "General" then goes to "Names" Section then On the Change Name window, type your first name, middle name, and your last name in the First Name, Middle Name, and Last Name fields respectively. *Please take caution because FB Restrict you to change your name for next 60 days time frame so be aware ! Step 5:Type your Facebook account password in the To save the setting, please enter your Facebook password textbox.then finally click on the "Save" Tab on your mobile app! ***Wait for 4 to 48 hours that Facebook takes to change properly ! So i think above shared Steps to change your profile name on Facebook will helped you to changed your identity on your social network ! But I will suggest you to Performed changes only when its really matters to you because FB has restricted changes for limited number of times!! Is India a Emerging Superpower??? 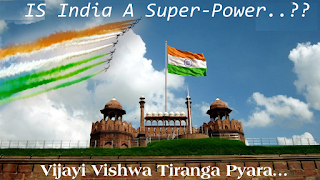 Today India is trend to become a powerful nation in the world map. India is a home of 1.25 billion people which is the second largest population in an country after china (1.6 billions). Every sixth people in the world is an Indian today. please take my advice to think about opening a Fast food Restaurant in India!! According to WFO India is one of the largest food consuming country in terms of street foods! !